The story trailer did reveal some interesting new information with the new footage that was included. This article will take a look at these discoveries. The following is part 2 of a 3 part analysis of the Bloodborne Story Trailer released by IGN. If you have not watched it yet, I highly recommend doing so before reading this. Also, if you are otherwise unfamiliar with what is known about the lore and story of Bloodborne so far, I recommend reading this overview before continuing. 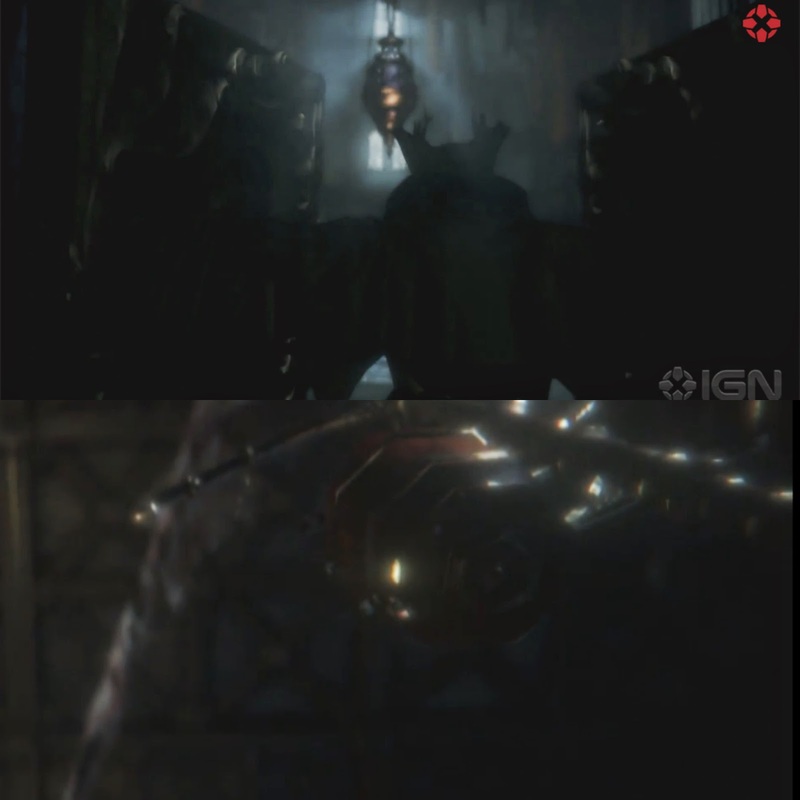 In the top image below, the protagonist is opening the doors to what I believe is the Yharnam Cathedral. The architecture of this space is very strongly suggesting a church, with its columns, statues, and high ceilings. Then, we see a church giant in this place. The there is the connection illustrated below. The chandelier in the top picture and the pendant on Priest Gascoigne in the bottom image is the same design. This seems to suggest that this is the symbol of the church in Yharnam. While this is a small detail on its own, I have a theory about what it may represent. The following is speculation about the symbol of the church. I think the symbol of the Yharnam church is the blood. The medical association that makes the "curative blood" is likely part of the church, as they are said to dwell in the Cathedral District and it is said that the church controls treatment of the Scourge (which I think is the curative blood). Then consider the symbol of the church. It may just be a design, but I think it represents a container. The chandelier illustrates this, with the solid top and base with glass walls in between. What would it be more likely to contain than blood? Although the symbol of the church and the blood container in the image below are not identical, these shots occur very close to one another in the video, their gold bases and glass walls as a point of comparison. This is very speculative, and is as likely to be wrong as it is right. However, it makes sense for the blood to be the symbol of the church, and I think the similarities between the symbol of the church and the blood containers serve to further support this idea. Full disclosure, I cannot claim credit for this find. 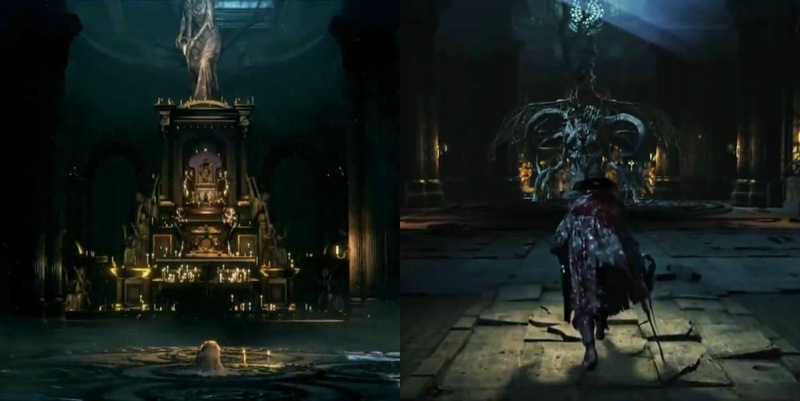 On /r/Bloodbornethegame, /u/Silver_Skull made the connection in this comment that the Shrine Woman looked to be in the same place as the Lovecraftian Horror from the Project Beast trailer. The below pictures show the comparison. The locations can also be connected by the ganged columns that appear in the picture of the Shrine Maiden in the video and the images below. It seems very possible that she will become a mass of tentacles over the course of the game. This is a small find, but the below image quickly appears during 1:25-1:25. There isn't much to glean from the image, but it is worth noting that there is snow on whatever is just below the arm, and there seems to be snow flying by in the background. The only area that has been shown to have snow is Cainhurst Castle, and as we know this is the only image of what might lurk in this mysterious place. This takes the prize for being the creepiest find. The wall shown in the image below has eyes on it. In addition, the spiders on the ground in the image are oddly spherical, and could possibly be eyes as well. This abundance of eyes suggests very strongly that this is the eyeball collecting Old Witch's mansion in Hemwick Graveyard, and that the odds of sneaking up on her are very, very slim. Part 1 of the analysis transcribes the trailer, documenting every scene and when it occurred, including speculation about the potential importance or connections scene have. You can find part 1 here. Part 3 of the analysis focuses on analyzing the dialogue from the trailer and deconstructing the narrative to figure out what story the trailer is telling. You can find part 3 here.